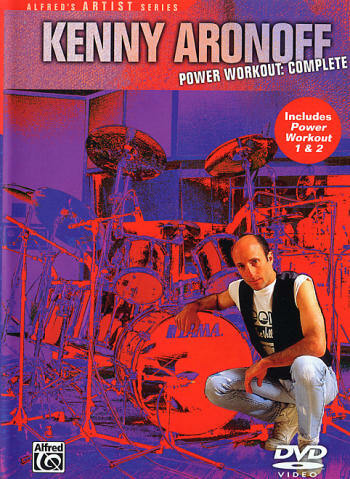 Tiger Bill Reviews Kenny Aronoff Power Workout: Complete DVD from Alfred Publishing. This DVD contains everything that was on the original two-volume VHS set and more. Let's check it out. The DVD is divided into three main sections: Power Workout 1, Power Workout 2, and Special Features. Power Workout 1: Kenny originally developed his Power Workout to help his own double bass playing. But, according to Kenny, this workout is just as effective for those who play single bass and I agree. Over the course of 10 lessons, Kenny has us playing various grooves for 2 bars followed by solos for 2 bars that will help develop coordination between the hands (using the first 13 sticking exercises from the first page of Stick Control) against the feet. For the 11th lesson, Kenny puts the 10 previous lessons together and plays them straight through performing his Power Workout #1, which takes approximately 13 minutes when played up to speed. Although seasoned double bass drummers won't find much to challenge them in this segment, beginners will get a good workout. Power Workout 2: Intermediate and advanced players will find this segment much more challenging. Kenny breaks it down into 12 lessons this time before playing it all together as Power Workout #2 in the final lesson. Kenny says he originally developed this workout to help him with develop his single stroke roll but this section will also help you with your ambidexterity as Kenny has you switching between right and left hand cymbal leads throughout. Kenny also includes polyrhythmic patterns in the cymbal part (3 against 4, 4 against 5, and 4 against 7) to keep things interesting. Once he gets to lesson 13, he demonstrates his entire Power Workout #2. This one is lots of fun and I'm sure that most of you will find it challenging as well. This section features six video performances of Kenny playing drum solos on tour with various artists and one from the Making of Burning for Buddy. Also included is a photo gallery and DVD-ROM features including PDF files of the two Power Workouts that you can print. Kenny uses the heel up leg technique when playing his bass drums, which buries the beater into the drum head with each stroke. So if you're looking to develop fast double bass drum chops, you'll need to look elsewhere. But if you want a copule of good daily workouts that will help you develop your power, endurance, precision, and coordination, Kenny's Power Workouts fit the bill nicely.